Here's my story, and an explanation of why I've been WW AWOL lately. My last month-plus was spent doing excise taxes and writing a whole, entire book. … and it almost never went to press! One fateful day, while finishing up my files, my computer crashed … and didn't restart. Ack! Which meant my book was GONE. Book saved! Goofiness with the Apple Store monitors ensuing! 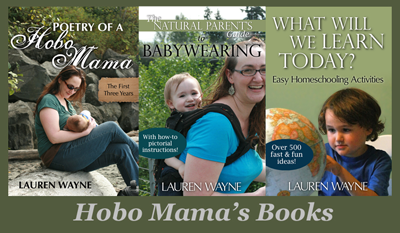 You can check out The Natural Parent's Guide to Babywearing here or as part of the Essential Parenting Collection: 35 e-resources devoted to transforming your parenting! is in the Early Years module, and the full collection. Note: I've renewed my LinkyTools subscription, but there was confusion over the corresponding PayPal address. So … I'm waiting for it to be manually approved. Until then, the linky won't be live; my apologies! Your linky isn't working. I'm SO glad your book was saved.